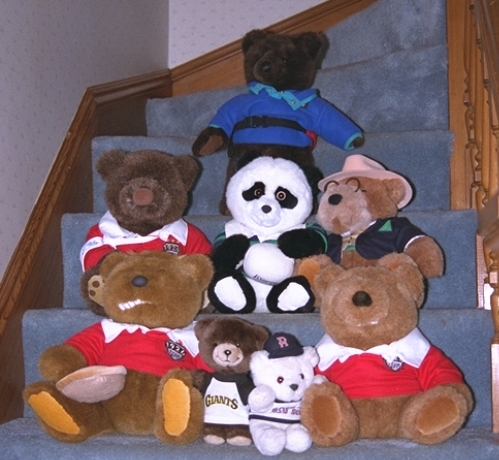 If you check our legacy photo gallery, you'll see before we were a kitten farm or even a puppy farm, we were a plush bear farm. One of our eldest and most revered bears, the rugby playing and networking Ping the Panda, is sad. He's been one of our supervisors in the network pantry (an alcove of the kitchen) for a decade or so, but we're slowing disassembling it in favor of moving the networking equipment into the cooler basement and elsewhere. Ping can't move down there, it's too dusty for a cuddly bear like him. Worst of all, we're disassembling it so we can move cat supplies and the dining room litterbox into the pantry area. Not bear friendly at all. Last night we set up new shelves in the basement, and we moved the core of the network down, including the network switch and cable modem. The router which sat between them was already in the basement, after it freaked out in hot weather a month ago or more ago. Now the kitchen only has a few patch cables to link the basement to our original office network ports, plus a couple of computers which are waiting for new homes. They say the living room is the new center for networking, we'll see if Ping is willing to move there.